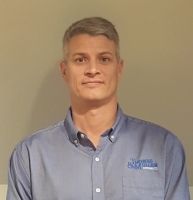 Frazier Thomas, President, Thomas & Muller Systems, LTD.
Frazier Thomas is a bulk materials handling expert who has been physically immersed in the field since childhood. He began his career under the wing of his Grandfather, helping run tests in his fabrication shop. As a young adult Frazier began working full time with his father at Thomas & Muller as both a salesman and a drafter. Frazier’s hands on experience and skill in designing custom bulk screw feeders has made him an asset in his unique field. His expertise has taken him throughout the entire United States as well as overseas. He has been active in testing a wide variety of materials and designing/fabricating bulk material handling systems, which he finds to be both challenging and rewarding. With decades of firsthand experience and being onsite to assess the materials and equipment requirements, Frazier has developed the ability to offer custom designs from concept to creation with pride.